may 25 you turned nine months old. you're sprouting before our eyes. i've been jotting down all the things that i want to remember on one of dad's yellow legal pads. every day i'm writing more in the margins and sideways across the top space, sloppily filling in the gaps. there is so much to say about you. boy, you are learning more and more every day. growing up so quick, making me laugh and making me proud. i find myself in awe that you were once a snuggle cubby on my chest, wrapped in a tiny bundle while i dangled toys or read to you. i once wondered what it'd be like for you to pick up things or smile at me. now you see something across the room and scoot your way over without thinking twice. you will smile readily at me and showcase your five shiny chompers. you sit and scoot and sip from a sippy cup and jabber and smack your lips. you are one industrious li'l boy; you love shuffling the books on the shelf, organizing my tupperware, discovering computer cords, trash cans, tv remotes and shoes. and you seem to know just which cupboards are off limits; yet you laugh in the face of danger. you like to lay your head on my shoulder before naptime, sit cozy in my lap at storytime and reach up for me to hold you. just a few things i love about you. not to mention, your hilarious intent to moon me at every chance you get, flipping over and crawling away while i change your diaper. you are one wonder baby; eating well, sleeping well and teaching us that wise men arise early. i love you for waking up early and being such a chipper bird. getting up early means we get papa to work, the groceries bought and the mail out before nine am. i make more of my day with you around. i've learned to cook efficiently; keeping one eye on the stove and one eye on you. i have found joy in watching you find joy in the simple things; like watching the dryer spin your clothes round and round. i love your expressions; your dimple, your gap-toothed grin, when you raise your eyebrows, scrunch your face or look like a very serious little man. i love when you find your reflection in a mirror. you lean over and kiss yourself and laugh and have a jolly old time with your twin. to you, a game of peek a boo is the best thing since sliced bread. you give me a hearty laugh, every time. and daddy only has to raise his fingers to get you to squeal with delight and anticipation for the tickle monster. the other day you and i were playing catch, rolling a wiffle ball back and forth to each other. your chubby fingers fit it perfectly. you mostly bat it away and go crawling after it. i encouraged, "come on.. roll it to me.. pass it over. you can do it." you wriggled right over into my arms as fast as your army crawl could take you, forgetting all about the ball game. hugging me tight or so it seemed. and i thought right there, right then, this is what baby love feels like. Awww! You are so wise to be recording all of these sweet details. Just finding out that we are having a little one last week - your post brought me to tears. What an amazing little man you have. Such a beautiful post, Oh if only I could one more!!! and great post, it seems like you really capture all of those important and adorable details. thanks for another wonderful post! what a great reminder to drink deeply of every precious day. they go by much too quickly. 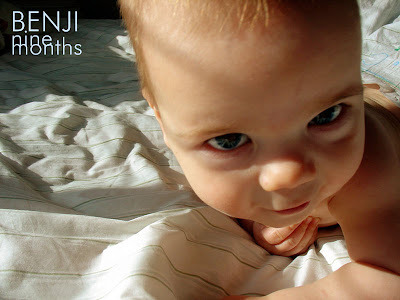 this post highlights benji's "baby love" (and he sounds like a dream! ), but your "mama love" also shines through. beautiful post. lovely observations of your sweet little guy. He is so handsome and sounds like a keeper! I love your positive attitude about getting up early ... so true. This makes my tummy hurt. He is so darn cute and sounds like a perfect boy! marta, your baby boy is SO cute! So beautiful to read this -- Gretchen is 18 weeks old now and I'm so excited to hear about what is coming up in the next months! I think you and the fam need to road-trip it out here to MO. I NEED TO MEET THAT BOY! It is KILLING me that I've never held him and smelled his yummy neck. Come visit! Now, dammit! i love that you've documented all of his current pursuits- how wise you are, miss marta. and oh, that hug at the end.. how can you help falling victim to his sweet charms? and what a joy to know that he belongs just to you!